If skies are clear at dusk in Western Europe and the UK on Tuesday, 19 February, be sure to glance up at the full Moon in the constellation of Leo. If the lunar orb seems a bit larger than usual then you’d be right, for this is the closest full Moon of 2019. 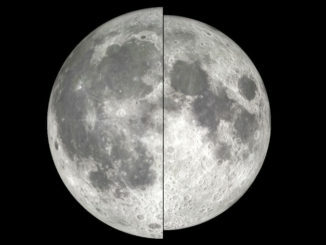 Since it occurs just 6¾ hours after lunar perigee, it’s also a supermoon. And if it’s cloudy, you can watch online! 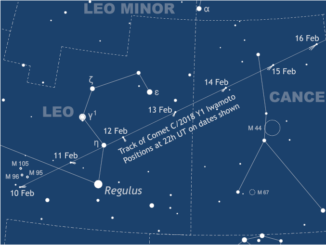 Grab your binoculars to catch a glimpse of speedy Comet C/2018 Y1 Iwamoto over the coming week before the glare from a full Moon on 19 February drowns it out. Potentially attaining magnitude +6, the comet passes closest to Earth on 12 February when it can be found traversing Leo at a rate of 7.2 degrees/day. Don’t miss C/2018 Y1’s close enounter with galaxy NGC 2903 on 13 February – by eye, camera, or live online. The Leonid shower is well known for fast meteors, the brightest of which can leave persistent trains that appear to hang in the air for several seconds. This year’s maximum is predicted for 1am GMT on Sunday, 18 November. With a 9-day-old waxing gibbous Moon setting around the time of the shower’s peak in the UK, prospects are good. 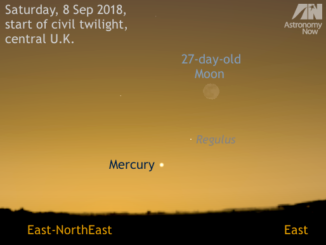 Mercury attains its maximum westerly elongation from the Sun on 26 August, meaning that the innermost planet is currently well placed for observation from the UK and Western Europe in the eastern sky around 40 minutes before sunrise. In addition to those in the evening sky, you might just see all five bright naked-eye planets this month! 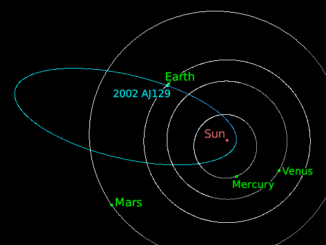 Possibly a kilometre or more in size, Apollo asteroid 2002 AJ129 passes just 10.9 lunar distances from Earth at 21:30 UT (9:30pm GMT) on 4 February — its closest approach for 114 years. For a few nights around this date the magnitude +12.6 body is well placed for observers as it gallops through the constellations of Virgo and Leo into Cancer at a rate of up to 40 degrees/day. We show you where and when to look for it. 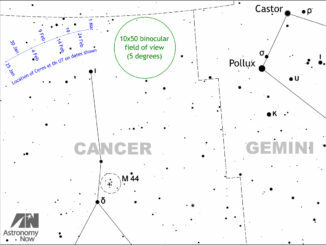 While antipodean observers are enjoying views of the totally eclipsed Blue Moon in Cancer the Crab on the night of 31 January/1 February, Northern Hemisphere observers should look out for magnitude +6.9 1 Ceres at opposition in the northern fringes of the same constellation. The dwarf planet puts on a good show in the dark of the Moon during February. 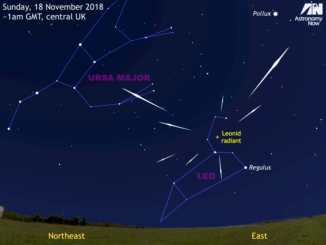 The maximum of the annual Leonid meteor shower, predicted to occur around nightfall on Friday, 17 November for observers in Western Europe and the UK, favourably coincides with a new Moon this year. However, observers in the British Isles may have to wait until around midnight to see about ten of the famously swift, bright Leonids per hour. 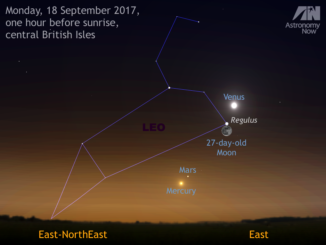 Observers in Western Europe should look to the east an hour before sunrise on Monday, 18 September to see not only dazzling Venus and the old crescent Moon in the same binocular field of view, but planets Mars and Mercury against the stars of Leo too. 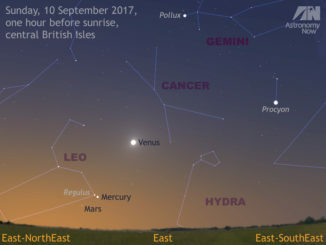 Observers in the UK and Western Europe should find an observing location offering an unobscured eastern horizon an hour before sunrise on Sunday, 10 September to see innermost planet Mercury just 0.6 degrees from Regulus, the brightest star in Leo. Conspicuous planet Venus is your convenient celestial guide to finding Regulus, Mercury and Mars. 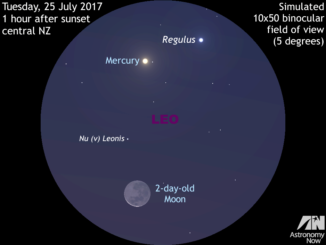 Mercury is generally something of a challenge to observe, but the run-up to a particularly favourable easterly elongation occurring on 30 July provides ample opportunities for locating the innermost planet in the evening sky — particularly from the Southern Hemisphere, where a prominent celestial marker in the form of a 2-day-old Moon passes close by on 25 July.